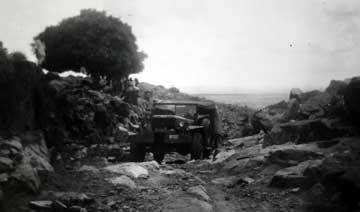 7th Battalion, Long Range (Motor Transport) Patrol, Bangalore, circa 1944. A Dodge 15 cwt truck carrying bridging equipment tackling the ravine. 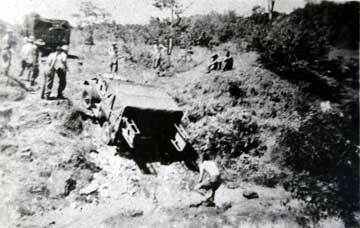 A Dodge 15 cwt truck driven by Corporal Brown of the Brigade 'Light Aid Detachment' bogged up to the axles on the second day out. The first serious obstacle to be encountered. 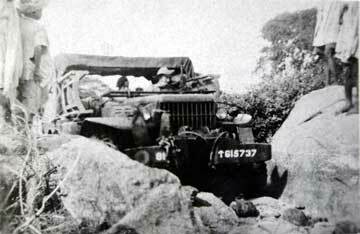 Note the boulders placed in front of the vehicles off-side wheels to raise the vehicle and prevent it jamming between the two large rocks. 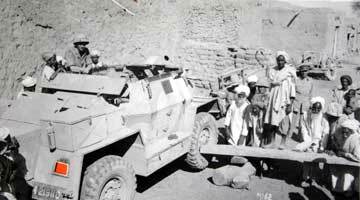 The King's Own Ford 15 cwt truck about to drive off the pontoon used for crossing the River Kistna. 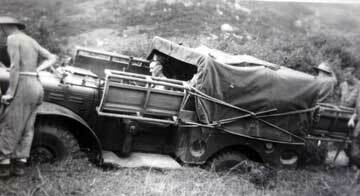 Private T Skyrme, 7th King's Own, the driver is seen by the cab of the vehicle. 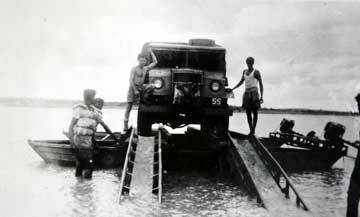 Other personnel are boat crew from the 1st Indian Armoured Division. 7th Battalion, November 1943. 'Un-ditching a carrier at a village near Lahore. 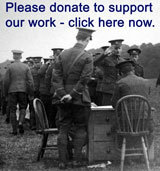 The censor has cut out from the original photograph a divisional or brigade marking, shown by the orange patch. 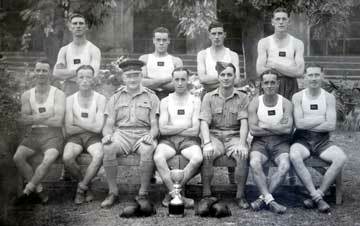 7th Battalion, Winners of the YMCA Novices Boxing Competition, Lahore, November 1943. Rear, left to right, Privates J Ford, W Barnes, J Finnegan, and W Lunt. Front, left to right, Privates R Jones, J Seddon, Lieutenant (QM) F Kenyon, Private H Gilbert, RQMS J Farghar, Private A Fairclough and Sergeant J Naugton. 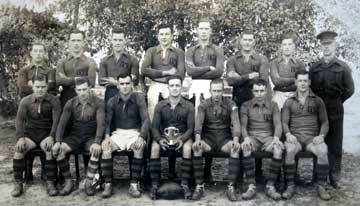 7th Battalion, Winners, Area Rugby Tournament, 1944. Rear row, left to right, Privates Turvey, Brace, Corporal Street, Captains Devonshire and Hogg, Private Bebbington, Lieutenant Thomas and Major Burton. Front row, left to right, Privates Machell, Williams 20, Bolton, RQMS Farghar, Lance Corporal Cook, Privates William 91 and Wilkinson. 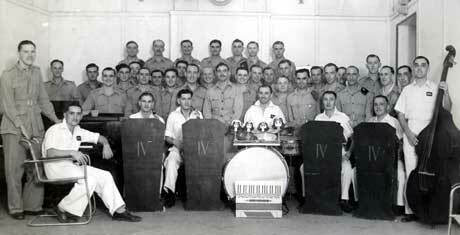 7th Battalion, Officers Mess, Napier Barracks, Lahore, Christmas 1944. Back row, left to right, Lieutenants E K Christie, P K Mantell, A F Urech and J Coulson (RA). Fourth row, left to right, Lieutenants, H W W Northwood, J B Craig, J Harrison, R Sowerby, C Riach, J Straffen, G J Jones, B A Green. 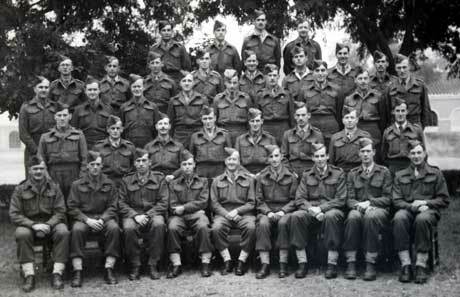 Third row, left to right, Lieutenants, K Beaumont, T K Taylor, J W Nisbett, 2nd Lieutenants T Thorpe, Lieutenants G R Suddards, H McC Gardiner, R Edy, Captain S F Mayfield, Lieutenant H R Martin. Second row, left to right, Captains R A G McIntosh, F T Welbourne, J Bush (RAMC), Lieutenants W H Lyon, G Thomas, J McC Waters Taylor, Captains H Rawcliffe and S I Martin. Front row, left to right, Captain (QM) F Kenyon, Majors W Odam, J Farish, M Corder (Second in Command), Lieutenant Colonel P S Watson MC (Commanding), Captain T S Juett (Adjutant) Majors J W Pocock, Major P A Hogg and Captain J W Devonshire. 7th Battalion, Sergeants Mess, Lahore, India, Spring 1944. Back row: Sergeants Orritt, Dilloway, Lance Sergeant Gatenby, Sergeant Smith, Lance Sergeant Leslie, Sergeant Irwin, Lance Sergeants Ward, Mullin and Croston. Third row: Lance Sergeants Smith and Richardson. Sergeant Ashworth, Lance Sergeant Jenkinson, Sergeants Hennessey, Mullholland, Kirtley, Shepherd, Soens, Ryan. 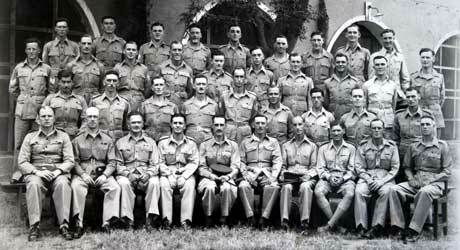 Second row: Company Sergeant Major Dymott, Sergeant Brown, CSM Walker, Colour Sergeants Lydon, Saunders, Sergeant Stenhouse, Colour Sergeants Hedley, Meecham and CSM Kelly. Orderly Room Quartermaster Sergeant Mitchell, Major A N Burton, Lieutenant (QM) F Kenyon, Regimental Quartermaster Sergeant Farghar, Lieutenant Colonel R P F White, Regimental Sergeant Major Austin, Captain T S Juett, Major E Calderbank, Company Sergeant Majors Morgan and Rawlinson. 7th Battalion, Sergeants Mess, Lahore, India, 1944. 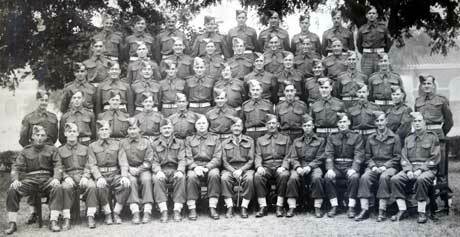 Back row: Lance Sergeant Ratcliffe, Sergeants Sibbald, Ovitch, Hennessey, Mellor, Mawson, Irwin, Westhead, Ashworth. Fourth row: Sergeants Ley, Flynn, Mulin, Orritt, Brown, Evans, Burford and Watson. Third row: Sergeants Winder, Taylor, McGuigan, Leach, Tosney, Degg, Levick, Taylor, Shepherd, Parker and Morris. Second row: Colour Sergeant Paynter, Sergeants Mulholland and Ensor, Colour Sergeants Hedley, Baker, Stenhouse, Hone and Cusack. Sergeants Street and Marjoram, Colour Sergeant Hughes and Segeant Deas. Front row: Company Sergeant Majors Brook, Meechan, Walker, Dymott, Captain (QM) Kenyon, RQMS Mitchell, Lieutenant Colonel Watson, RSM Austin, Major Corder, CSM Kelly, Captain Juett and CSM Miller.